Occasionally you might need to convert some PDF files to word format. If the PDF file size is too huge, it will probably take up a lot of your time waiting for the conversion to be done. AnyBizSoft PDF to Word Converter is a user friendly and efficient software application that can easily convert Adobe PDF files into well formatted editable Microsoft Word document at a speedy rate. The conversion application features a simple interface and is pretty easy to use. Users do not need to install Adobe Reader or Acrobat in their machine in order to use this application. AnyBizSoft PDF to Word Converter can quick convert PDF files to word format and preserve the original layout of text, columns, tables, graphics and hyperlinks of PDF files in Ms Word documents. There’s no need to retype or reformat the converted documents. AnyBizSoft PDF to Word Converter supports importing Adobe PDF 1.0—1.7 formats (.pdf) and encrypted PDF file conversion. There are three efficient conversion modes available: Batch conversion—Convert 200 PDF files at one time; Partial conversion—Select any pages from the PDF file to convert; and Right-click conversion—Right click on a PDF file and convert it into a Word document without launching the program. This software application supports Windows 2003/XP/Vista/7 32bit. The new version of AnyBizSoft PDF to Word Converter 3.0 costs $29.99 to buy. However, the software developer is again (after free giveaway of AnyBizSoft PDF to Word Converter 2.5.3) offering a great promotion to users who are keen to use this software for free. Users who want to grab the free promotional AnyBizSoft PDF to Word Converter 3.0 can go to the software developer’s Facebook page and register themselves. Firstly, click on Like button, then enter the first name, last name and email address and click on “Send Me Keycode” button. Users will thence be given the serial number via email. The giveaway version is only for personal use. 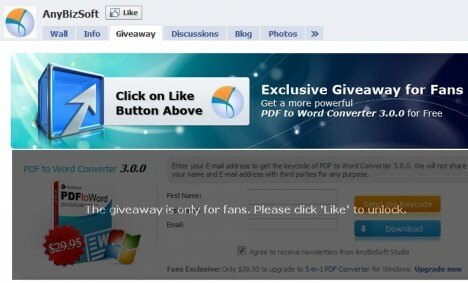 Tip: It’s also possible to get free AnyBizSoft PDF to Word Converter without facebook. AnyBizSoft PDF to Word Converter for Mac OS X is also available for free.